The Prettiest Bows I've Seen! 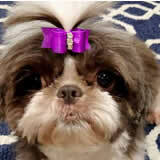 I have been looking for years for beautiful, high quality bows for my shih tzu and I finally found them here at Bow Biz Dog Bows. In the past, I've gone to pet stores, pet boutiques, grooming stores, etc. and I can never find these type of bows. They are usually "box store" selections and I wanted very specific bows that I see on show dogs. I finally asked one of my friends because I always saw her beautiful bows on Instagram and she sent me the name of your company. I had so much fun placing my order. The hardest part of the process was trying to decide what I wanted. There was so many beautiful and creative designs. Now both my shih tzus can match and be the most beautiful girls of all - thanks to my BowBiz Dog Bows. I so appreciated the quick turnaround and the thoughtful note handwritten on my invoice. Thanks Susan!